The Statue of Liberty officially celebrated her 100th birthday on October 28, 1986. The people of France gave the Statue to the U.S. in recognition of the friendship established between the two countries during the American Revolution. Arguably America's most recognized symbol of freedom, the Statue has welcomed countless immigrants from her post on Bedloe's Island. Meticulously designed, this set of three remarkable coins is a dazzling tribute to America's greatest symbol of freedom. 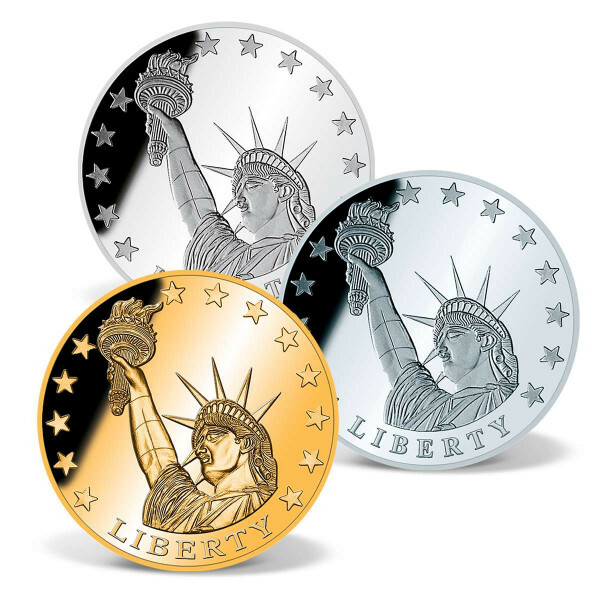 Each coin features a highly detailed engraving of Lady Liberty on the obverse and is exquisitely layeredin a precious metal: one in 24k gold, one in .999 pure silver, and one in pure platinum! These coins are minted to the highest quality "Proof  standard and come in a beautiful wooden collector box, custom-crafted to preserve and display your precious coins for generations to come - a true collector's item.